One of the biggest concerns parents have for their children relates to “screen time” and their use (or overuse) of technology. While it’s common to hear that teens are addicted to technology, increasingly their younger counterparts – toddlers – appear to be just as hooked. Before you go into a negative spiral over your toddler’s attraction to your smartphone, computer or tablet, relax. 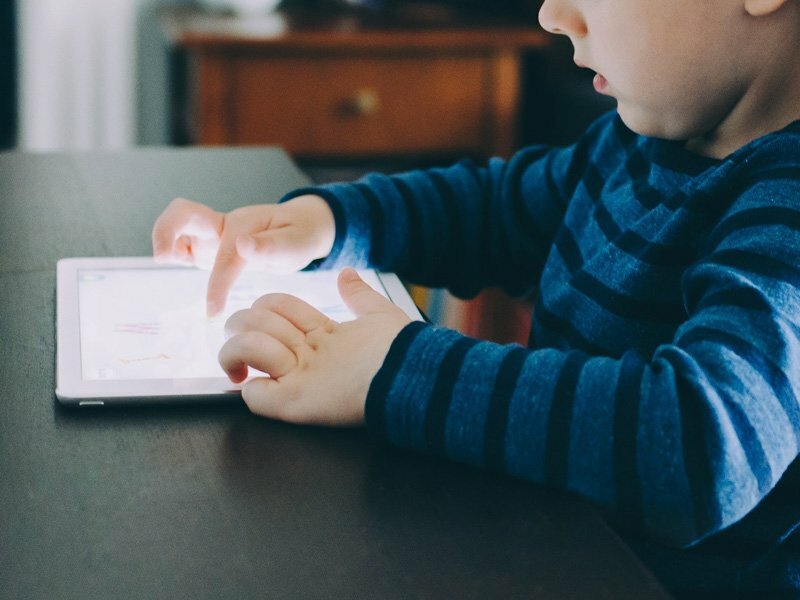 While the concern over too much screen time is legitimate, and its full effects on early childhood development over time remain to be seen, there is evidence that allowing your child to interact with technology in moderation has several positive impacts on his or her growth and development. It turns out that playing with touchscreens can actually stimulate your toddler’s brain. The potent combination of audiovisual stimulation and physical interaction is shown to “generate heightened levels of cognitive activity,” according to recent research from the UK-based TABLET project. You may notice that not only does your toddler like to look at what’s on the screen, but he or she can also use your smartphone almost as well as you do. The ability to tap and flick a screen before having fully developed fine motor control is shown by research to hold positive potential for both infants and toddlers. This interaction is something that other toys do not allow – taking young children’s natural curiosity to new levels. From the act of exploring the use of the digital device itself, to the wide variety of educational apps, you can take steps to ensure your toddler is interacting with content that broadens his or her horizons. The very “trial and error” nature of using this technology stimulates increased cognitive ability. Like anything else in your toddler’s life, too much of any one thing can be over-stimulating and, well, too much. By striking a balance between the use of technology and traditional games, you’ll help set your toddler up for success. It’s still fundamentally important that children play, explore, run, fall, get dirty, paint, and jump – in short, be children. Learning and playing with touchscreens is fine, but using those devices as a daylong babysitter is not. A 30-minute block once or twice a day for children up to four-years-old is a good rule of thumb for starters. As the parents and primary caretaker of your child, you know when he or she is tapped out… or good to go for a longer time. Technology might be a great wind-down to a nap, or it could be best when your child is most awake and engaged. Choose the best time for your toddler to enjoy screen time. Not all apps and games are created equal. Look for those that foster your child’s development, growth, and learning. Check the features out carefully, and choose those that best offer interaction, cognitive stimulation, creativity, and language skill development. Be present during these periods of use. New technologies have different dangers, and you want to be sure to monitor what your child is up to at all times. Sitting on a screen for any stretch of time can be a stagnating activity. Be sure to get your toddler moving by promoting a counter-balance of physical activity. Go outside, pull out active games and toys and shake off sitting and lying down. In addition, promote painting, drawing and other ways to stimulate creativity, curiosity, and learning.